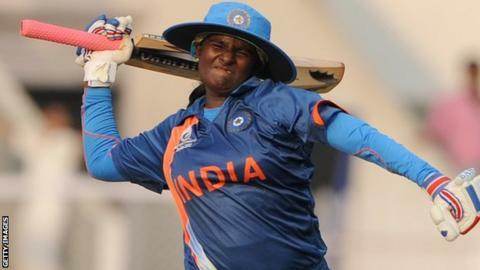 Thirush Kamini became the first Indian woman to hit a World Cup ton as they beat the West Indies by 105 runs in the ICC Women's Cricket World Cup opener. Playing in Mumbai's Brabourne Stadium, the hosts hit their highest World Cup total, ending their 50 overs on 284-6. The Windies' run chase started badly when Kycia Knight was run out after two balls. And, despite a cameo of 39 runs from 16 deliveries from Deandra Dottin, the tourists were all out for 179. India's Jhulan Goswani was impressive with the ball, taking two wickets and going for 13 runs off her 9.3 overs. She then hit 36 off 21 balls with the bat after being sent in at number three by captain Mithali Raj. Defending champions England, who are in Group A with India and the West Indies, start their campaign against Sri Lanka on Friday.